When a monkey’s bathroom routines change or becomes loose for several days. This photo was taken before we found out that Chewie had a urinary tract infection. When I took him to see our vet, he was having problems with his tail. He seemed to be in pain and was also showing sign of depression. Because he was 18 years old, the vet felt that he was getting close to the end of his life. He, of course, checked out his tail injury and gave him some medicine that would help him deal with the aches and pains that he was experiencing. We talked about a blood test to check his kidneys but we both felt that it was much too risky to pursue that, so the vet told us that more than likely he was in kidney failure and that he just wanted to keep him comfortable. He also suggested some diet changes and then we left his office. The next time that I visited the vet’s office was when I had two back to back jobs that were out of state and I needed to get a health certificate for the monkeys that would be traveling with me. When I arrived I pulled Chewie out first from his travel cage to show the vet how much better his tail was doing. As I was doing this Chewie urinated on my hand. It was such a large amount I said to the vet, “I wish we could check his urine”. The next thing I knew he was running back inside his office to go and get the urine test strip. We both were shocked to find out that it was just an infection instead of old age. It was not his time, of course, to pass but it was a time for him to be put on medicine to heal his infection. He is now 19 ½ years old and doing very well. 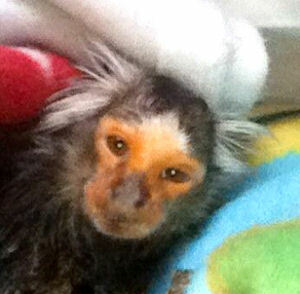 Only his monkey caregiver would know that the look in those eyes was not normal. This is our very special Beauty before her surgery. 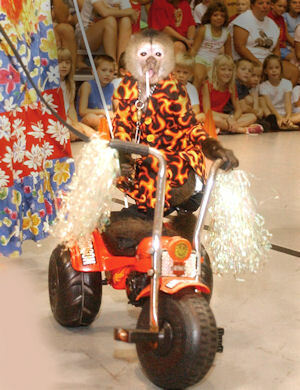 She was cycling repeatedly, which in not normal for a female monkey. The vet felt that he would need to spay her so we took her to do the surgery. When doing the surgery, he found that she definitely had un-healthy ovaries and that he would need to send them to be tested. We waited three weeks as she was healing up from her surgery to hear the great news that she had only cystic ovaries. She is doing wonderful and we were all thankful that she was blessed with the no cancer diagnoses. Diabetes is one of the illnesses that you will begin to have many signs of before the illness becomes life threatening. A monkey begins to drink a huge amount of fluids (water) often throughout the day. A monkey begins to pee often and the diapers are heavy. 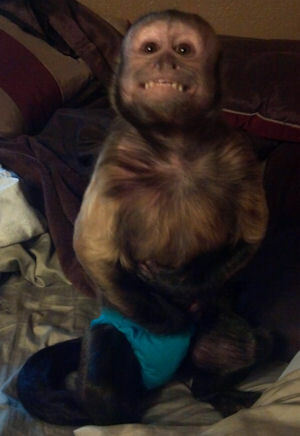 A monkey’s diapers or blankets are often heavy with urine. A monkey wishes to eat all of the time and never seems to be filled up or satisfied. A monkey has a glowing red face, mainly around the temple area and often across the eyebrow area. A monkey’s hair is missing on both the hands and feet due to the imbalance in the urine which is coming from them (if you do not diaper your monkey). A monkey may start loosing fingernails. A monkey may develop a breath that smells sweet. A monkey’s eyes become red around the eyeballs and lids. Maggie Mae is my diabetic monkey. She has been insulin dependent for 16 years. In order, to manage her diabetes it takes constantly watching her body language, blood sugar, the look around her eyes to see if (the red glow is present like in the above right photo), how much water she is drinking and being able to match her diet with the amount of insulin she is given everyday. Emotional issues can also affect monkeys who are diabetic. One day before this photo on the right was taken, we had lost Polly (age 32). She was like a mother to Maggie. 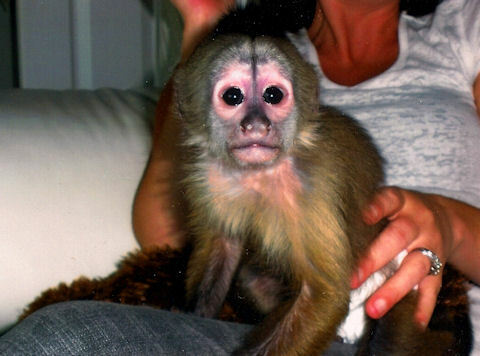 Polly had been the monkey who had helped me raise Maggie and all of the younger monkeys in my troop. You can actually see the hurt, stress and loss on her very red diabetic face in the photo of Maggie. Her blood sugar was running high that day because of all of the emotional issues centered around losing Polly. This is not a photo that I thought I would ever share due to its private nature. I am glad that it can be helpful now, in letting everyone see what a monkey who has diabetes looks like when they are very high. The red can actually go back further into the temple area too, especially when they are high like Maggie was that day. This is sweet Polly Wally age 28 with a young man that did not wish to have Polly Wally as his girlfriend? The first sign of her illness started with her getting the red glow around her face and losing weight. By checking her for diabetes I found out that another reason that a monkey can become diabetic is when there is a hormone change. It turned out that the diabetes was masking the real problem of a cancerous tumor on her right ovary. When there is a shift in the hormones or a monkey starts getting older, they can have trouble with diabetes. It was the hormones shifting that caused the vet to do the exploratory surgery and found the tumor. When she had her surgery, the vet was very pleased at her prognosis. He said that we got it early and it was completely contained. We were not only celebrating the great prognosis for Polly Wally but we were also celebrating no diabetes problems after the surgery. The one important thing that we were not thinking about was the grief factor. Polly and I were very close. She loved me in such a special way and since she was a wild-caught monkey, I loved and respected her differences. She did not like to be held or to be on the ground. So, when she was out with me I always allowed her to be on my shoulder. 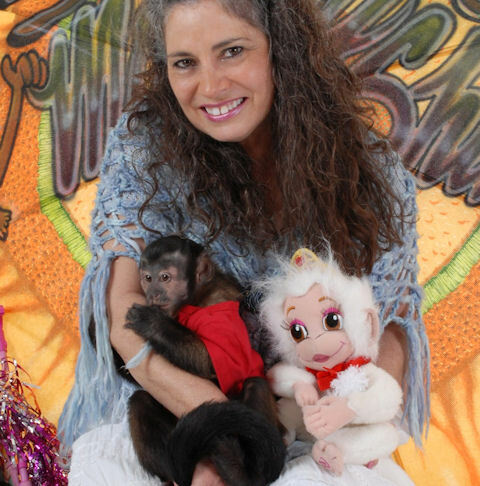 The year she passed away I had lost two other monkeys that had been with us for many years. The stress and grief that she was feeling plus the grief that I was feeling was way too much for her to live with. In my heart of hearts, I believe that she was so upset that she grieved herself to death over the boy monkey Andrew, who had a terrible accident right in front her. She was unable to help him as he passed away, and she was unable to help me either. Because a monkey’s emotional feeling are so much more advanced than many other animals, it is a very important thing to remember that our monkeys are grieving with us too. Their little bodies (and, for that matter, ours too) are not meant to grieve for months or years. The cells of the body will begin to change with long periods of grief. He loved to ride and have fun! 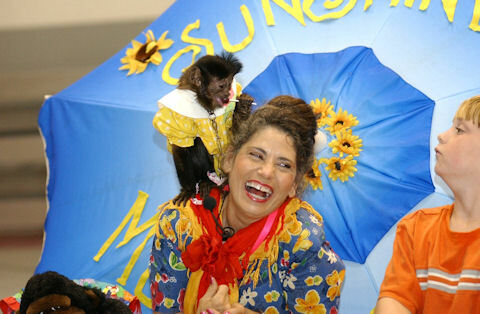 He and Polly were a team at the SunShine MonkeyShine’s “Education through Entertainment” Presentations. They both passed away in 2007. Monkeys can live for a long time with diabetes before the life-threatening time will begin for them. Knowing the previous signs talked about here is very important for being able to regulate your monkey’s disease. Monkeys can also live with much higher counts of glucose in their blood than we can live with. Knowing this is an important piece of information, but this does not mean that you should ignore the important signs of the illness. The organs and over all health of a diabetic monkeys is deteriorating during the process of having the disease un-checked. If you are aware of the important signs and act upon them, it can be controlled with diet changes or both diet changes and oral medications. But if the illness of diabetes goes on un-checked for months or years it will become necessary for your monkey to be controlled by a regimen of insulin and diet. This illness is a terribly hard disease to regulate in humans and even more so in monkeys. Many often will choose to euthanize their monkey because of the necessary monitoring and expense of using diabetic insulin and supplies without having insurance to help with the cost. Although it is rare, some monkeys are born with diabetes. However, diabetes is given to monkeys most often by not feeding them properly. I believe Maggie was born with a low acting pancreas. I was very reluctant to test her for the illness because I was aware of the process that she and I would have to start going through together. I have written a book about our story and how much we both had to go through to get her regulated on her journey with diabetes. It is called “Maggie’s Special Mission.” This book will be available soon. Any breed (or type) of monkey can get diabetes, so it is important to learn what foods are acceptable for them to eat. If you are going to let them drink your sodas, sugared drinks, or eat things like chips, suckers, pasta, breads, sugary fruits, and any other type of foods that are full of high carbohydrates, your monkey has a good chance of contracting diabetes. Did you know that monkeys are used in diabetes research because it is so easy to give them diabetes? Feeding monkeys what you eat at dinner is not the proper way to feed them. Monkeys need to be fed a variety of different kinds of foods. When feeding the monkeys, protein should not be forgotten to be fed to them regularly. We should always remember to limit the fruits and give them an abundance of vegetables. We are all learning new things about the low glycemic index list. This list gives us the ability to choose the fruits and vegetables that are considered low on the list. Monkey chow is good if your monkey can and will eat it. It has a well balanced mix in it of the necessary vitamins and nutrient but must be fed in moderation because it is a food that is high in carbohydrates which turn into sugar in their bodies. Please learn everything that you can about a good diet for your monkey, not only because of diabetes, but to keep your monkey healthy for years to come. Allergies or Allergic Reactions to different things is also another type of illness. Many monkeys will show signs of illness such as throwing up and diarrhea as their reactions start to escalate. A monkey has a rash for several days. A monkey sneezes time after time during a long period of time. A monkey throws up after drinking his bottle every time. A monkey has loose feces for the next day after you have fed him. For food allergies it is much harder to find the source of the problem than for allergies arising from things that they are inhaling or rashes that are being caused by thing that are touching them. I have a monkey that has food allergies, and I can tell you that it is a very hard thing to deal with. She is allergic to wheat and corn. She is very thin and will throw-up or have bouts of loose feces. Bless her heart, I am trying to get this under control as fast as possible. Her entire system is not up-taking the vitamins and nutrients from the foods so I feel as if we must become very aware of all things that are given to her during this latest change in her problem with foods. Of course, because of her allergy to wheat she is not able to eat her much loved monkey chow. It has been very hard for her to watch the other monkeys eating their monkey chow. 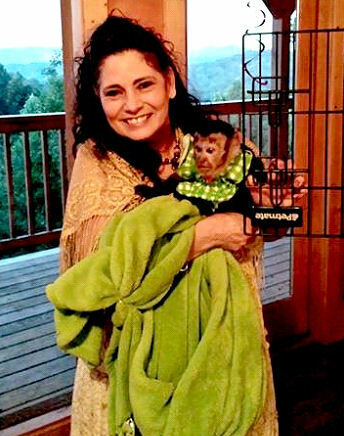 Her problems started very young but were not found out about because her original owner did not know what to look for being a first time monkey caregiver. When she came to live with me, I started to feed her monkey chow. This was how I discovered her wheat intolerance. So, I started feeding her things that were made from corn and rice to make up for her inability to eat wheat and the same thing continued to happen. The normal thing, of course, to do with food allergies is to go through the process of eliminating foods from their diet and then reintroducing things back into their diet. Finding out that she was also allergic to corn was an added problem due to her loving a round of corn just as the other monkeys do. I try to watch the amount of corn, white potatoes and white rice that they get in their diets due to the high carbohydrate count of these three things. If you are allergic to wheat, you will begin eating lots of corn and rice in your diet, in order, to make up for the problem of not being able to eat wheat. As it was for me with Sophie, I thought we had fixed the problem but we had not. I was fooled by the foods that were labeled gluten free. As it was in Sophie’s case the corn that was added to the food was also causing her problems. In the beginning Sophie seemed to have depression that was stemming from her food allergies. I have continued to work at trying to find things that she will eat and enjoy. The depression problem does not seem to be an issue for her anymore since we have found out the different things she is allergic to. Since I am constantly right on top of her eating difficulties, I can sense a problem with her right away. I am so sorry that her diet is such a problem for her. I make mistakes often not knowing that the food that I might be giving her has a wrong ingredient in it. I do hope that your monkey does not develop an allergic problem with their food or formula because it is definitely a hard thing to deal with and seems to be even harder to get diagnosed. 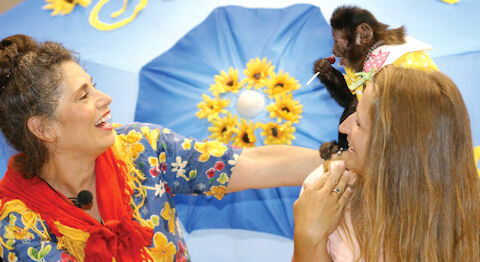 If this does happen to your monkey please do not give up on having a healthy and happy monkey. When you become a monkey caregiver, it is very important to be aware of the fact that monkeys are not like children in the way that they respond to not feeling well. We hope that this post will serve you well during your time of caring for your monkey. The lists that are posted here are just partial lists of symptoms that monkeys will show. The main thing to remember from reading this is that you must act fast and get your monkey to a responsible monkey vet when they obviously have started showing symptoms of illness.